The ‘One Chip Spinning RGB POV Display’ with conversion software. 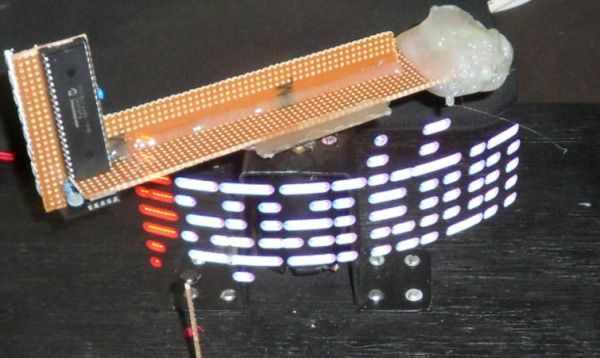 If you have been on the look out for a project that combines, RGB LED’s, a motor, a microcontroller and a ridiculous amount of hot melt glue, then you have certainly come to the right place. This project allows you to create (with minimal components) a fantastic customizable display capable of displaying graphics, animations and text. You can scroll your graphics from top to bottom or use it as a scrolling message display, scrolling from right to left. The project uses just one chip, eight RGB LED’s and a handful of other components to paint animations in ‘mid-air!’ Plus, together with the included graphic conversion software (download link in step 2) you can easily create your own animations because the software creates all the code for you. So please, read on and enjoy! Get your required parts and tools. Before we set out on this venture, you will need both the components and tools. – POV Image Converter (Software that I have made, download link is included in the instructable)Now that you have all of that, let’s get into the construction. Please read the readme.txt file for instructions on how to install the software. Now the beauty about this project is that you don’t have to make it exactly how I have made it. my original intention was just for me to see how small a board I could fit this project onto. But as you will see, there is plenty of space to work with when we attach the main arm that connects the display to the motor. So by all means, have a look at my design – but there are certainly other ways (simpler ways) of achieving the desired outcome. I have cut my board so that I have 26 holes by 10 holes. Solder the Red, Green and Blue connections to the board. You will also notice I have cut a line through the tracks connected to the LED’s. This is so we can solder in some series resistors to limit each LED’s current. I have also used surface mount resistors to keep my project small, you may very well want to use through hole to make things a little easier. The resistors solder in over the tracks that you have just cut. Cut some more tracks and solder in a ground wire. Time for a quick test. Progressive tests are always a good thing, so let’s do one. Grab a 5 volt power supply and solder your negative end to our ground connection. 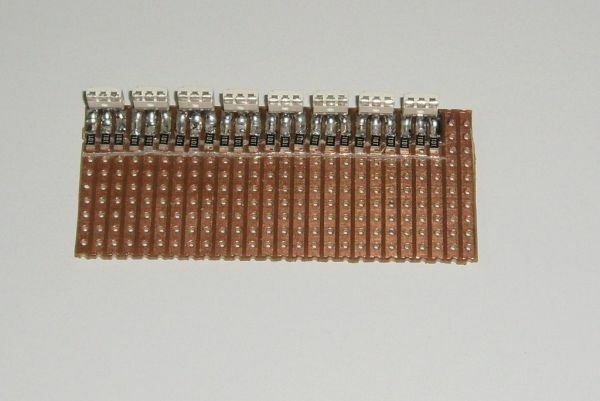 then with the positive side, connect it to each resistor one at a time – you should have each LED light up with the respective color as you work your way through all 24 connections. It’s nice to pick up on faults before we get to carried away! Install the microcontroller, socket and cut some more tracks. Now it is time to solder in the socket which will house the microcontroller. Or if you wish, just solder the microcontroller straight in (if it is to be a permanent arrangement). Then you will need to cut a line of tracks so that we do not short each end of the microcontroller together. – see the last photo.